2.1.2. Install CocoaPods Without Using sudo. This document provides information on usage of RHMAP Client SDKs for all supported platforms. Gradle is a Java-based dependency management and build tool used for Android app development. It is used to distribute and integrate the RHMAP Native Android SDK with your app project. Gradle uses the JDK version specified in your PATH environmental variable. You can also set the JAVA_HOME environmental variable to point to the installation directory of the desired JDK version. To install Gradle, follow the installation instructions and setup instructions on the Gradle website. Alternatively, to install Gradle using the SDK manager tool, follow the section with instructions on installing Gradle using SDKMAN on the Gradle website. Apache Maven is a project management and build automation tool for maintaining and distributing Java code. It is distributed under the Apache License, version 2.0. In an RHMAP context, is used to distribute the RHMAP Native Android SDK. Maven uses the JDK version specified in your PATH environmental variable. You can also set the JAVA_HOME environmental variable to point to the installation directory of the desired JDK version. You can download the latest version of Maven from the Maven developers' website. See the Maven documentation for detailed instructions on how to install and configure Maven. This SDK allows the user to use RHMAP APIs with native Android apps up to Android M (version 6.0, API level 23). The RHMAP Android SDK is an open source project hosted in the FeedHenry Android SDK repository on Github. Feel free to fork it and contribute. Before using the SDK, make sure you have the Android SDK or the Android Studio installed. You can download both from the Android Developer portal. Download the sample app to get started with a new native Android application which has the RHMAP SDK already included. Add this dependency to the app’s build.gradle file, not the project’s build.gradle file. If you are not using Gradle, you can manually download the SDK in a JAR along with its dependencies. For more details, see the Usage section in the README file of the SDK’s Github repository. This data is not considered security sensitive data. For more on app security such as User Authentication, see $fh.auth Client API. See Projects - Connections for more information on connections between Client Apps and Cloud Apps. If the app targets Android M (API Level 23), use a version 3.x or higher of the RHMAP Android SDK, ideally the latest version. The 3.x version of the SDK was introduced primarily because of a significant change in the Android SDK - the Apache HTTP Client. Apache HTTP Client (org.apache.http package) is no longer distributed with the Android SDK as of Android M. The RHMAP SDK now uses cz.msebera.android:httpclient as an HTTP client instead. Upgrading an existing app to target Android M will also require an update to the app so it will use the new HTTP client. If Gradle is not being used, use the HTTP client’s JAR files which are distributed with the RHMAP SDK and are available in the deps folder of the repository. For information on compatibility with Android N (API Level 24), see Android N.
Android N allows you to use certain Java 8 language features, such as lambda expressions. A lambda expression enhances the readability of code and also allows you to express instances of single-method classes more compactly. This contrasts with Anonymous classes which can be cumbersome. For more info, please refer to the lambda expression tutorial : https://docs.oracle.com/javase/tutorial/java/javaOO/lambdaexpressions.html. Make sure your code is working before migrating. Update the fh-android-sdk dependency from 3.1.0 to 3.3.0 in your package management software. Update the build tools and target APIs in the AndroidManifest and build.gradle files to API level 24. Build your app locally and validate that everything is working. As Jack is no longer required, disable Jack to use the improved Java 8 support built into the default toolchain. For more information, see Use Java 8 Language Features. Android plugin 3.0.0 requires Gradle version 4.1 or higher. For more information, see Update Gradle version. Update the fh-android-sdk dependency to 3.3.0 in your package management software. 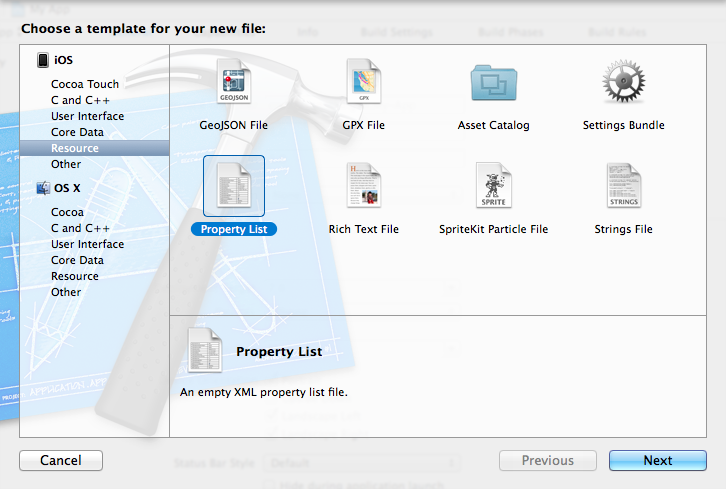 CocoaPods is available only on OSX. CocoaPods is a Swift And Objective-C dependency manager for Xcode projects. It is built with Ruby, which comes pre-installed with OSX. It is used to distribute the RHMAP iOS Swift and iOS Objective-C Client SDKs. To install CocoaPods using the RubyGems package manager, execute the following command. This requires the sudo command to be enabled in OSX. Alternatively, to install CocoaPods without using sudo, follow the Sudo-less Installation section of the CocoaPods Getting Started Guide. This SDK lets you use RHMAP APIs in Objective-C apps for all iOS versions supported by RHMAP. The RHMAP iOS Objective-C SDK is an open-source project hosted in the FeedHenry iOS SDK repository on Github. Feel free to fork it and make a contribution to this project. 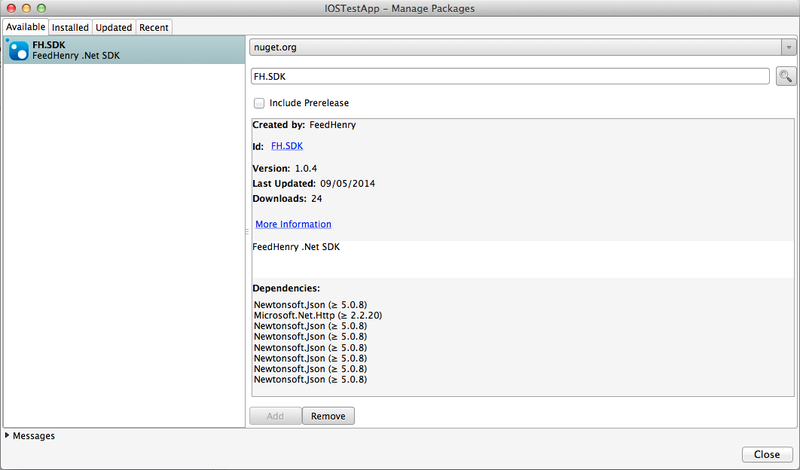 Before using this SDK, make sure you have the Xcode IDE installed. You can download Xcode from the Apple Developer Portal. Clone the sample app to get started with a new iOS application which has the RHMAP SDK included as CocoaPods dependency. Open the blank-ios-app.xcworkspace workspace in Xcode. 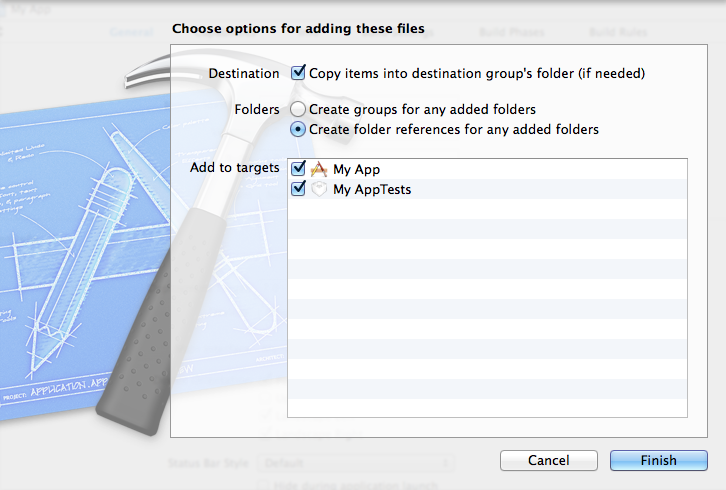 The required dependencies are located in the Pods group. 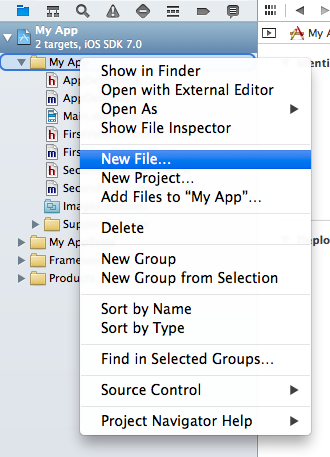 Clone the sample app to get started with a new iOS application which has the RHMAP SDK already included. Open the blank-ios-app.xcworkspace workspace in Xcode. 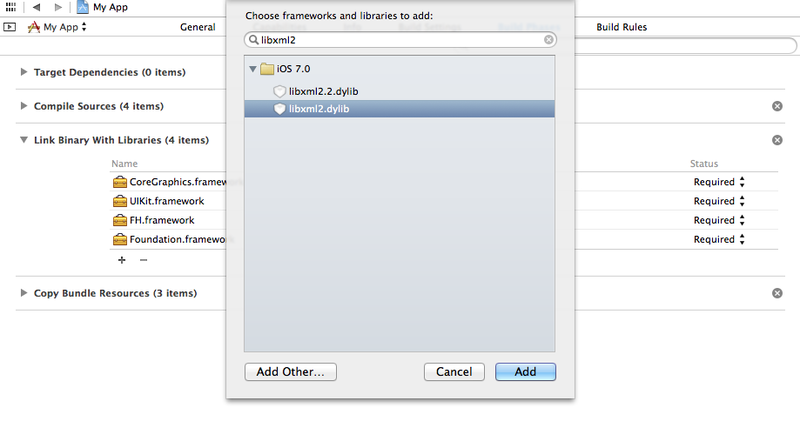 otherwise add the FH framework to your Xcode project. Replace 3.1.1 with the version of RHMAP iOS Objective-C SDK you are targeting. If you do not specify a version number, the latest version in the CocoaPods central repository will be used. Download the SDK and save it as fh-framework-latest.zip. To integrate the SDK, extract the FH.framework file from the Zip file you downloaded above. 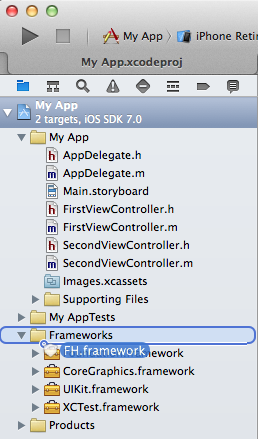 Once downloaded, drag the FH.framework file to your Xcode Project. In the dialog, accept the defaults and click Finish. To add these, go to Build Phases > Link Binary with Libraries and add the above dependencies as link dependencies. 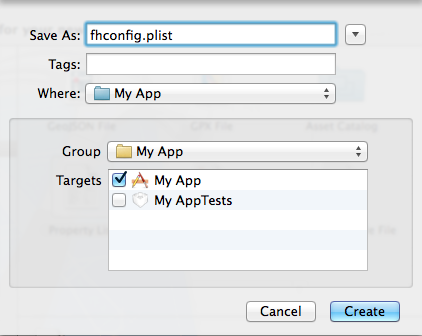 Finally, add a Property List file called fhconfig.plist to your Project. If you encounter this problem, refer to the Red Hat Knowledge Base article Swift-based iOS application crashes upon startup when signed using an enterprise distribution certificate without Organisational Unit field for detailed instructions on how to resolve the problem. 3.1.1.2. Install CocoaPods Without Using sudo. This SDK lets you use RHMAP APIs in Swift apps for iOS version 8 or higher. The RHMAP iOS Swift SDK is an open-source project hosted in the FeedHenry iOS SDK repository on Github. Feel free to fork it and make a contribution to this project. Install the Xcode IDE. You can download Xcode from the Apple Developer Portal. Install the CocoaPods dependency management system as described in Section 3.1.1, “CocoaPods”. Clone the sample app to get started with a new iOS application which has the RHMAP iOS Swift SDK included as a CocoaPods dependency. Replace '4.1.1' with the version of RHMAP iOS Swift SDK you are targeting, ProjectName.xcodeproj with the name of your project and TargetName with the name of your target. If you do not specify a version number, the latest version in the CocoaPods central repository will be used. You can now open ProjectName.xcworkspace in Xcode. Review the Swift migration guide. Open the Xcode 8.x workspace by double clicking on the ProjectName.xcworkspace. When prompted to migrate the code, choose Swift 2.3. Name functions and methods according to their side-effects. Those without side-effects should read as noun phrases, for example, x.distance(to: y), i.successor(). Those with side-effects should read as imperative verb phrases, for example, print(x), x.sort(), x.append(y). Names of types and protocols are UpperCamelCase. It is unlikely that the app code will compile first time. Fix your code until it passes all unit tests. Consider your API label names using the Swift Api Design Guidelines. 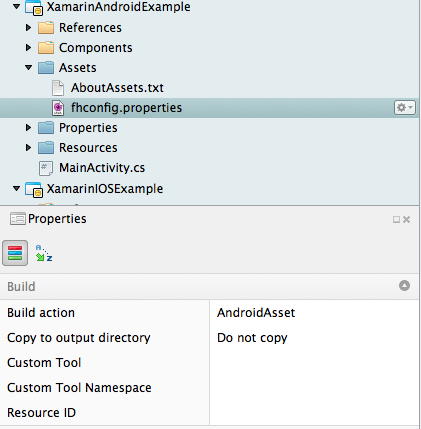 This is a standard Xamarin App which allows you to create Native iOS and Android apps in C#. The SDK itself is an open source project that is hosted here. Feel free to fork it and make contribution to this project. 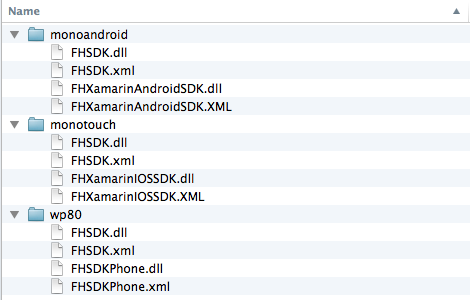 Before using this SDK, make sure you have Xamarin developer tools installed. You can download them from here. We recommend you install Xamarin For Visual Studio as well. Download the sample app to get started with a new Xamarin App which has the RHMAP SDK already included. The app contains 4 sub-projects. It is setup to use Portable Class Libraries to share code across all the apps. More details about this approach can be found here. App.Core - A PCL project. The code in this project is shared by other apps. Most of the app’s business logic should be defined here. App.Android - An Android app project depends on the App.Core project. Normally it should contain UI code and Android-specific code. App.iOS - An iOS app project depends on the App.Core project. Normally it should contain UI code and iOS-specific code. You can install the SDK to your project either automatically (using NuGet) or manually. FH SDK is available on NuGet: https://www.nuget.org/packages/FH.SDK/. 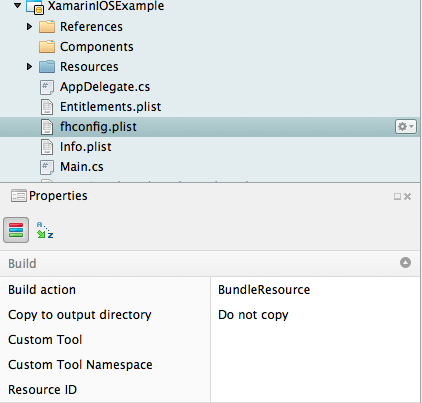 If you are using the NuGet plugin inside Xamarin Studio, search for FH.SDK. NuGet will install dependecy libraries automatically. Download the SDK and unzip it. Adding the .dll assembly files from the folder that is corresponding to your project’s build target as references. If you are developing a Portable Class Library project, only reference the FHSDK.dll file. The SDK depends on Json.Net and Microsoft HTTP Client Libraries. You need to install the assemblies of those libraries as well if they are not available in your project. For each platform-specific application, you need to create the corresponding configuration files. The content of each file should be the same as described in each platform’s native SDK doc. fhconfig.plist in the root of the application. Set build action to BundleResource. fhconfig.properties in the Assets directory of the application. Set build action to AndroidAsset. To use the RHMAP .NET SDK, you will need to initialise the SDK like this in the platform-specific project (not the PCL project) when app finish starting. Depending on your app’s build target, only one of these name spaces should be available to your app. The main reason for having the same FHClient class defined in different name spaces is to ensure that the platform-specific assembly file is loaded correctly. The Init method is the only one that is called using FHClient class, and is the only one that needs to be called from a platform-specific project (for example, Can not be called from a PCL project). All the other SDK methods are called using FH class which is defined in the FHSDK.dll assembly. This assembly can be references by other PCL projects. This way if your cross-platform solution contains a PCL project, you can reference this assembly file and call SDK functions from there. See API Docs for full details on the APIs available within the SDK. You must have Node.js installed on your system to use npm. It is recommended that you install NodeJS version 4.x or later, which includes npm version 2.x by default. To install NodeJS on systems running RHEL, you must obtain the installation files from the Red Hat Software Collections. Installing NodeJS requires a subscription to the Red Hat Subscription Manager. To install NodeJS on RHEL, follow the guide on the Red Hat Developers Portal. See the official Cordova website for more information on Cordova. fh-js-sdk is distributed using npm. To be able to complete the steps below, you must install npm. "appkey": "<Client App API key>"
This is a Node.js + Express web application. These apps provide more advanced desktop/tablet web portals and mobile websites. They expose the full power of Node.js for web app development including functionality such as Express 4 and server side templating using template engines such as ejs. Download the sample app to get started with a new Web App which has the RHMAP SDK already included. Add the following code to your index.html file. More information on connections can be found here.